In case you need help designing a gallery wall! As I have mentioned before, I am slowly working on filling up the many white walls in our apartment. 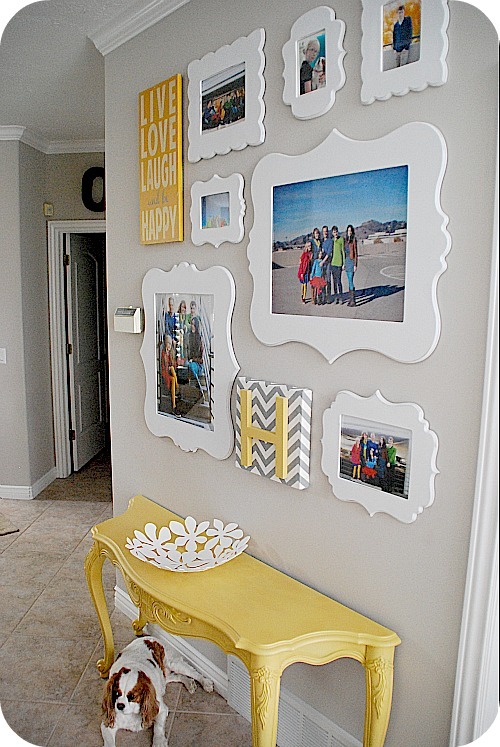 I start almost every project with looking online and on Pinterest more specifically for inspiration. 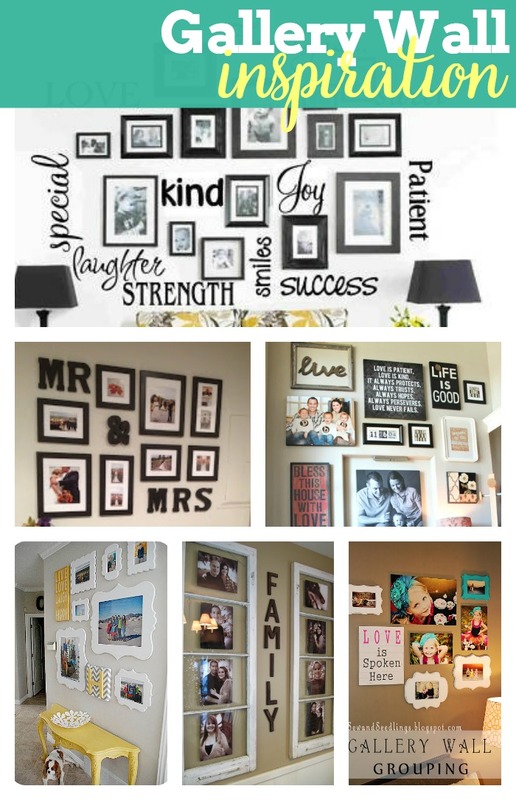 In case you are looking for help designing a gallery wall, I wanted to highlight some of my favorites! Hopefully they will inspire you, too! 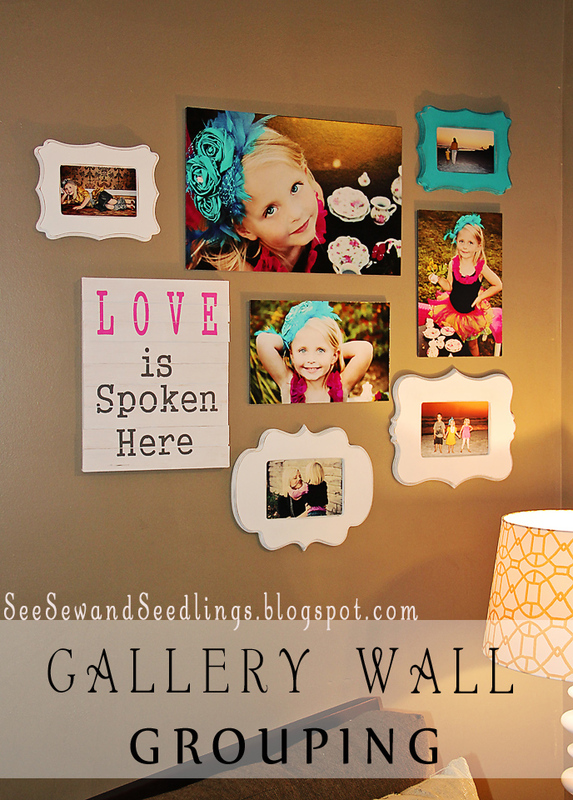 See Sew and Seedlings: I love the mix of frames and canvases for this gallery, especially the bright blue frame that picks up the blues from the pictures. Cottage Instincts: I absolutely love the use of old window panes and desperately want my own vintage window frame. William and Jacqueline: While it won’t work for us now, I plan on using this for inspiration for our next bedroom. Tatertots and Jello: As always, I love Jen’s sense of color and the way the table finishes off the look. This picture always makes me want to paint furniture. I am Momma Hear Me Roar: I think it is really hard to fill a staircase, which is the next white wall I will probably want to attack in our apartment. I especially love the umbrella and “come what may” decal in the bottom right. 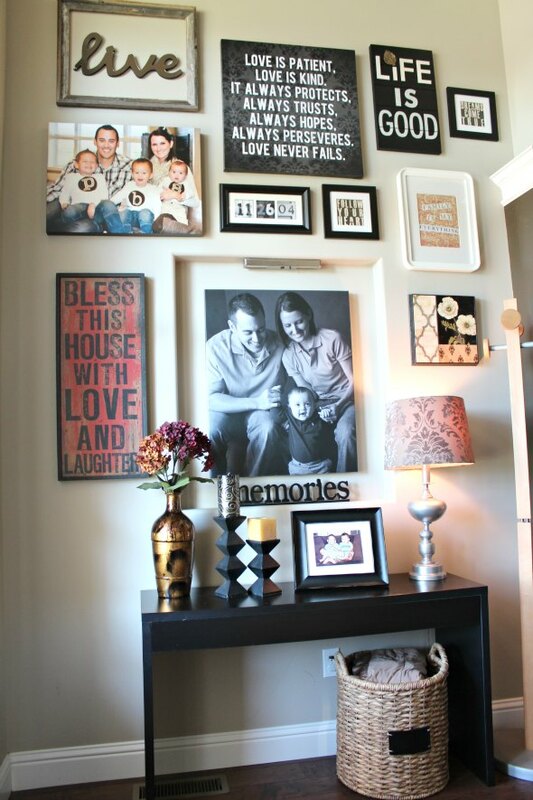 House of Rose: This is one of the most eclectic gallery walls I have seen and yet everything goes so well together. Lil’ Luna: What a wonderful way to feature a family! 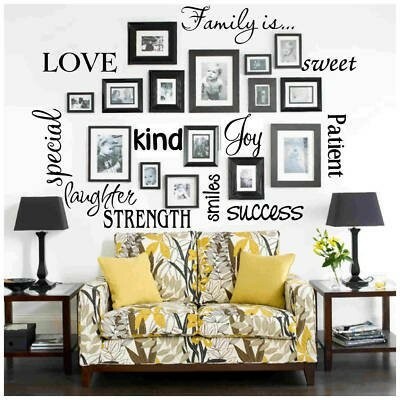 I am such a huge fan of words in art, so I think this is a such a unique way to fill space and highlight the special qualities of your family. Bowdenisms: This chalkboard Wall Gallery is definitely unique and a sweet touch for a nursery. Dimples and Tangles: This gallery wall is all mirrors! 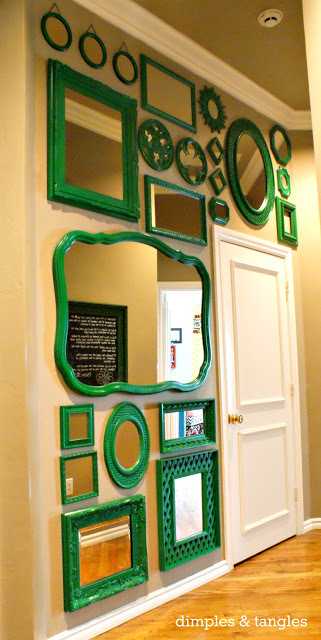 The green is a fabulous touch of color and the mirrors help open up the space. Tidbits from the Tremaynes: I think this is such a great and manageable gallery wall because it allows you to more easily update and switch out items. 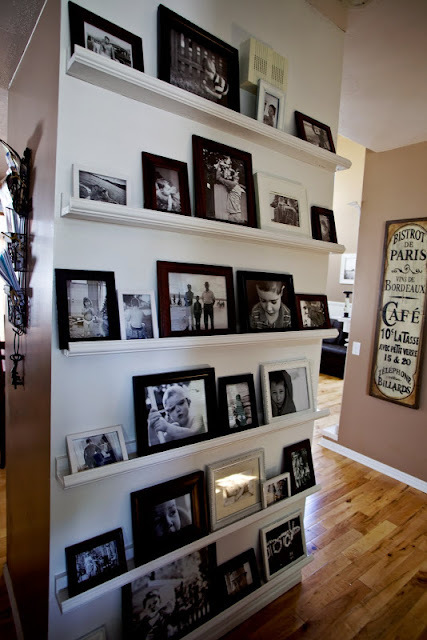 They have a really wonderful tutorial for how they did their shelves. I am hoping that I will be sharing my wall with you soon enough! As of this moment, there are 4 items hanging on the wall. There is still more to go (obviously) but at least there has been some development. 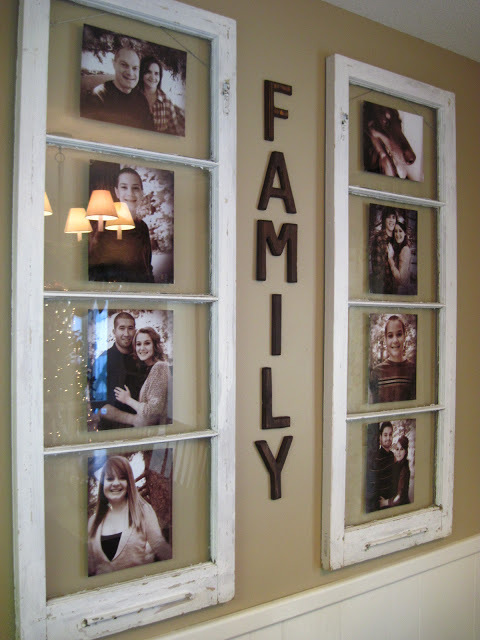 i love the window pane idea but how do you get the pictures to stay on the glass? and are they on the back or front of glass. It was not my personal project, so if you head over to Cottage Instincts, they will show you a step by step tutorial. However, all you need for attaching the photo to glass would be clear photo corners (you can find them in the scrapbook section of a craft store) or double sided tape. Thanks so much for the shutout! I love every single one of these! Fab! I am happy to do so, Mandi! I loved your post and the end result. Thank you for stopping by my blog. It means so much! Thanks for including me in this mix!! You are welcome, Mandy. I think you did such a beautiful job, so I was happy to share with my own readers. These are all so great….and I’m honored to be featured! Thanks for sharing! You’re welcome, Courtney! I love sharing great projects when I can!